This is such an empowering birth story and I’m so thrilled my friend Sarah has agreed for me to publish this. What I love about this birth story is how someone who has had some a complex birth history managed to turn it around to take ABSOLUTE control of her birth and had complete faith in herself. I feel honoured to have this story here. When I found myself pregnant with my 6th child I knew I couldn’t have a repeat of the previous 5 pregnancies where I felt the system let down. I didn’t want to have to explain my complex history at each appointment or feel coerced into interventions I didn’t want. I didn’t want to leave each appointments feeling as if my consent wasn’t sought, as a PTSD sufferer it really is a horrible feeling. I found myself making the choice to go it alone. I had my booking in appointment at 8 weeks where I declined any further antenatal appointments. I did agree to telephone calls with one community midwife at the same time as regular check ups. I also let the head of midwifery know I would be seeking home birth support from 36 weeks and I would like a home birth kit dropped off. My intention was also to call them after the birth but I wanted to birth alone. I went for private scans at 16, 24, 35 weeks and reported back that all was ok to the community midwife. I read a lot of birth books, I fully submerged myself in the freebirthing world and I believed my body and mind could do it. I hit a couple of bumps in the road where I found myself in triage. While there I felt bullied and given every scare story by doctors to get me to agree to there way. I could have crumbled but I didn’t. I found the strength to continue with my plans to birth my way. I had the most amazing freebirth with only my partner in the room. We connected on a whole new level, he kept me grounded and kept the space protected as I breathed out baby out. It’s was the most mesmerising, uplifting, spiritual experience I could have wished for. I felt like a warrior woman and yet I felt the calm in the stillness. She entered the world to quiet stillness. She was placed one and we were at peace. The midwife’s arrived and gave us time but we needed a transfer in to hospital. From there on I was once again at the mercy of the medical team that surrounded me. The actions of one midwife left my daughter more unwell than she should of been, I received a fully apology. Would I take control again? Make my own path? My own destiny? Take full responsibility for my unborn babies health? Yes, yes a thousand times without a second thought. 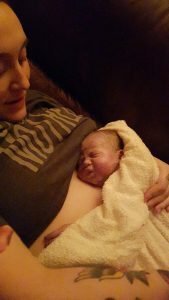 A huge thanks to Sarah for sharing her birth story. Sarah is an awesome mum to 6 children. She is now using her knowledge and has trained to be a doula based in Falkirk, Scotland, You can follow her on Instagram (@sars4). She’ll be writing some guest posts on us here about freebirth. Whilst it might not be a birth choice that everyone wants to make, it’s so important in the world of choice that women realise that they can make this choice. In exactly the same way that women might choose a caesarean, an induction, a homebirth, an epidural etc. Freebirth is a birth option that should be spoken about openly and honestly and for many women it is ABSOLUTELY THE RIGHT CHOICE. If you’re keen to explore your OWN CHOICES then sign up for the Birth Bundle or download the FREE Resources Bundle today which includes our brilliant Pregnancy Roadmap, an MP3 Fear Release Visualisation, 101 Questions About Birth and details of our fantastic FB Community and Free Birth Plans Course.